Finding and/or coming up with writing prompts can be difficult and time consuming. I have put together 19 prompts for you to use with your students. 8 are generic, basic persuasive (4) and informative (4) prompts – they are NOT text-based. The others are text-based writing prompts. There are excerpts from an Inaugural Address from Bill Clinton, Poe’s “The Raven” poem, and two Barack Obama Inaugural Addresses (these prompts utilize both texts). 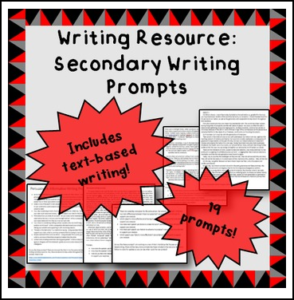 The generic prompts could be used as low as 6th grade, but are probably more appropriately targeted for grades 7-10. The text-based prompts are definitely not appropriate for students below grade 7, and some of them may work better for higher grades, as they address rhetoric, which may not be taught that early. The 8 basic prompts come from my Expository and Persuasive Writing Workshop, so if you own that, those will not be new for you. However, the text-based prompts are not currently part of any product, although I am working on a text-based writing workshop resource that should hopefully be out some time later this year. The resource is in .pdf format, but for an editable version, please contact me for details.